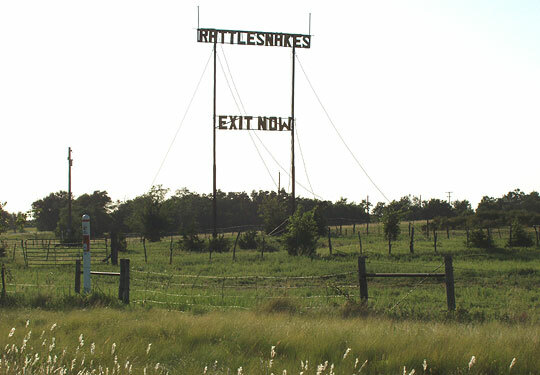 The "RATTLESNAKES EXIT NOW" sign along Route 66 in Texas has been my favorite Texas site since I ran across it in 2003. I shot the photo above from the west-bound lane of I-40 in July of 2005. I guess I love the sign because, of all the worthy sites along the route in the Lone Star State, the sign for a defunct reptile ranch most evokes the Rt66/I-40 of my childhood, strewn with far more shlockish sideshow/roadside attractions than it has today. Last year I saw a dim echo of this when I shot a traveling reptile show along Rt66 in Joplin. It didn't hold a candle to the reptile ranches I saw as a kid...the ones everyone got their dads to pull over for by jumping up and down in the back floorboard of the station wagon (seatbelts?...those things had seatbelts?). 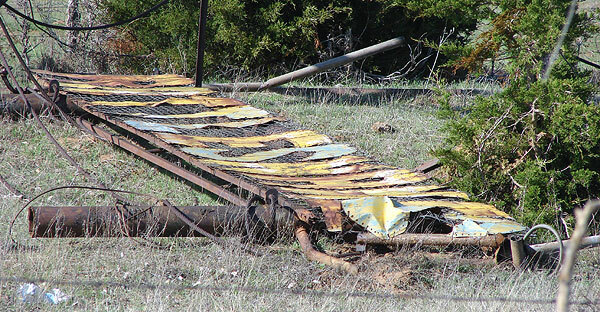 "...the Lela area also marks the last stand of roadside reptile exhibitor E. Mike Allred. 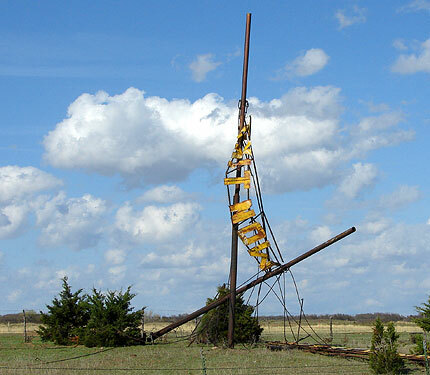 The surly carnival man—who at one time operated snake attractions along Route 66 near Elk City and Erick, Oklahoma—moved to Texas to establish the Regal Reptile Ranch at Alanreed. He partnered in this scaly enterprise with his sister, Addie. But when business relations grew rough, E. Mike moved his share of snakes toward Lela and set up shop in the old service station that had once been graced by Conald Cunningham's Neon Steer. Today, E. Mike's towering RATTLESNAKES: EXIT NOW sign survives as a local landmark. E. Mike's old building has been moved to McLean and now serves as part of the Red River Steakhouse. E. Mike himself can best be honored through a visit to the Devil's Rope Museum of McLean, Texas—where some of his sister's pickled snakes remain on display." I looked for the sign as I passed by on March 11, but it was too dark to see. On the way back through this part of Texas, on March 24, I saw the ugly truth. One post remains upright; the other appears uprooted or broken and is held up only by the structure of the rest of the sign. Snakes in the grass - "RATTLESNAKES" lies in the grass at the base of the posts. "EXIT NOW" is twisted about 135 degrees around, being read properly from the southwest as opposed to the east. I do hope this is fixed and re-erected. 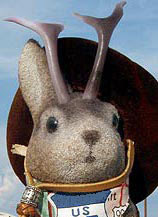 Texas just isn't the same without the promise - even a long-expired one - of snakes on a plain.